The Electronics Line EL-MDC52 has been discontinued. No direct replacement is available. 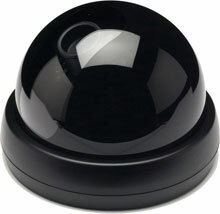 The Electronics Line EL-MDC52 is a color mini-dome camera with 1/3" Sony Super HAD CCD image sensor. Powered by a digital signal processor offering high quality images at 520 TVL resolution, it is available with a variable-focus 2.9, 4.3, 6 or 8 mm lens. It also features excellent low-light sensitivity (0.5 Lux at F1.6 minimum illumination), auto-tracking white balance, automatic gain control, back-light Compensation, signal-to-noise ratio of 48dB, built-in reverse power input safety circuit and a durable housing. Includes 12VDC power supply & BNC Video connector cable. An optional mounting bracket is also available.